I found my diaries that I kept when I was around 11/12 onwards and reading it brought me to tears, So much happened that I forgot about, events and experiences that I shouldn't have went through at all, but most of all I'm sad to look back and remember just how bad things could get for my mum. 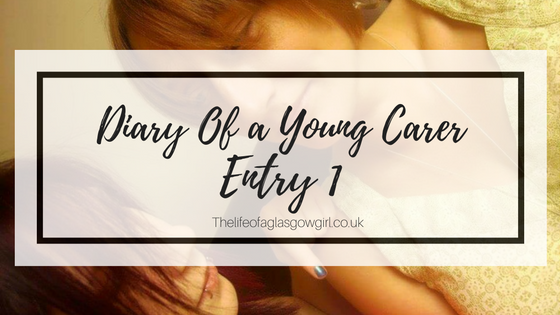 I have decided to do a series here on my blog about what it was like being a young carer for my mum who had a multitude of things affecting her. I want to shed light on the fact that young people do go through this and take on pretty heavy burdens at such a young age. Although I am no longer a young carer, I know what it's like because I have experienced it. So I'll be inserting some passages from my diary that I kept when I was younger, all these experiences are not fabricated and do depict my true life when I was that age. Entry 1; Is she the hulk? I'm not sure where it all went wrong for mum today, maybe it was the mail man not bringing her online order, or maybe it was because she took her pills later than normal, but something has set her off and I don't know what. I've missed school again today because she didn't want me to leave her on her own, she's scared they will come and take her away again if I leave even though they won't but she doesn't understand this. She shouted at the cat for jumping onto the worktop then lifted him up onto it not even 10 minutes later? Why? I'm confused because she just gave him into trouble for this? My gran came home from my grandads about half 2 to discover I didn't go to school yet again and now they are arguing. My gran says I need to have an education but my mum can't be trusted with her medication and refuses to let a professional carer come into the house. She doesn't even like her nurse who gives her the jags in her bum, I'm not sure what they are for still but I hope they help her. Gran was hoovering the living room so didn't hear mum shout on her from the bedroom, now mums angry again. She came into the living room & lifted the coffee table above her head, screaming at us. I don't know why I laughed but that only seemed to make thing worse because she threw the table against the couch and it smashed. She's in her room again and I can't stop crying. Gran got cut and has been outside for 15 minutes now. I wish I was normal, I wish my family was normal. Mum is refusing to take her night time pills again insisting that she doesn't need them, I've tried to give them to her 4 times now but she won't have it, she threw the glass of irn-bru at me so I laughed again and she chased me to the bathroom where I locked myself in. Why won't she take her medication? Why won't she let me help her? Today I didn't go to school again and I miss the friends I have. I had to tell them I was "sick" again but I wasn't sick. Mum is locked in her room watching stargate, gran is in the living room and I'm here writing in you because I have no one else to tell. I want to go to the drs and tell on mum, I want them to make her better because she isn't better now, she throws things again and has fits more often. I just want to go out with my friends and play at the pitch (our den) E came in for me today but mum answered the door and told her I'm not allowed out. Why can't I see my friends? Maybe I'll go to school tomorrow, maybe mum will take her pills. If gran didn't have to go to grandads so early maybe I could go to school? Ps. Teddy is still getting big, he's not such a furry kitten anymore.